In the third part of the series we get into mak­ing icosa­he­dra, sub­di­vid­ing and refin­ing them to spheres. To top it off, we’ll also look at two ways of set­ting a mesh’s shad­ing to smooth. So, why icos­pheres? Icos­pheres have a more even dis­tri­b­u­tion of geom­e­try than UV Spheres. Deform­ing UV Spheres often gives strange results near the poles due to the high­er den­si­ty of geom­e­try, while icos­pheres give a more even and organ­ic look­ing result. On top of that icos­pheres are asym­met­ri­cal which helps sell an organ­ic defor­ma­tion. This tuto­r­i­al is based on the orig­i­nal icosa­he­dron code from Andreas Kahler adapt­ed to Python 3 and Blender. I bet you already know this by now. Let’s start import­ing and then move on to our usu­al scaf­fold­ing. In the set­tings, subdiv will con­trol how many times to sub­di­vide the mesh and scale will be a sim­ple uni­form scale para­me­ter much like the ones in the pre­vi­ous tuto­r­i­al. Set­ting subdiv to zero will cre­ate a icosa­he­dron (instead of an icos­phere). Note that a subdiv val­ue of 9 will result in a mesh with over 5 mil­lion faces. You may want to stay below that val­ue depend­ing on your hard­ware (or how bad­ly you want to crash Blender!). Sim­ply sub­di­vid­ing the icosa­he­dron will only get us a refined icosa­he­dron. We need to make sure the ver­tices come togeth­er in a way that resem­bles a sphere. To do this we’ll have a vertex() func­tion that fix to the unit sphere (and does the scal­ing too). 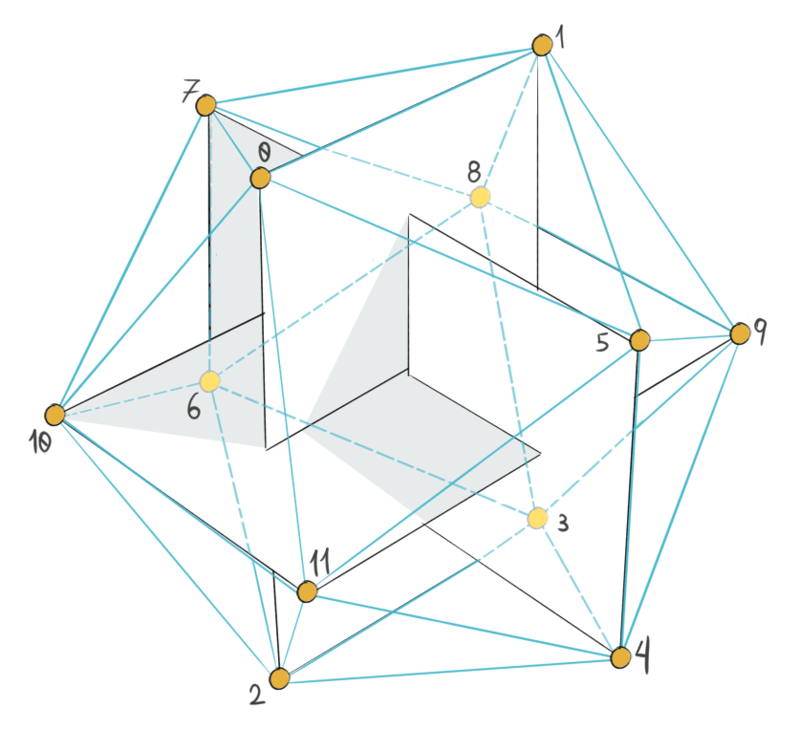 Now that we know the verts are falling on the unit sphere we can go ahead and cre­ate the base icosa­he­dron. Like the cube before, the eas­i­est way is to input the ver­tices and faces man­u­al­ly. One of the ways to build an icosa­he­dron is to con­sid­er its ver­tices as the cor­ners of three orthog­o­nal gold­en planes. They are gold­en planes because they fol­low the gold­en ratio. 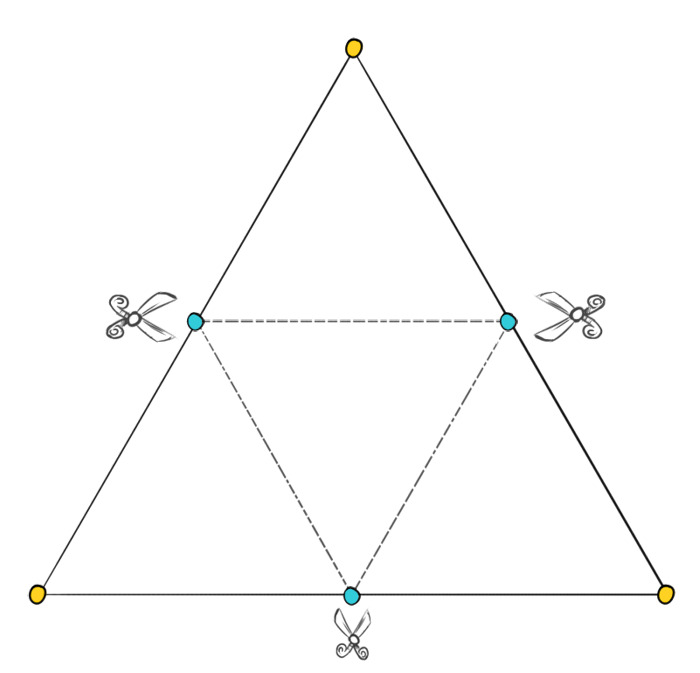 The ver­tices of these planes lie on the coor­di­nates (0, ±1, ±φ), (±φ, 0, ±1) and (±1, ±φ, 0). Note that the let­ter φ (phi) rep­re­sents the gold­en ratio val­ue, while ± means “neg­a­tive or pos­i­tive”. These com­bi­na­tions result in 12 ver­tices, which cre­ate 20 equi­lat­er­al tri­an­gles with 5 tri­an­gles meet­ing at each ver­tex. Check out the fol­low­ing dia­gram (points are numer­at­ed for the faces list below). Damn, that’s a lot of math! How­ev­er it’s all fair­ly straight for­ward (and repet­i­tive) when you think about it. A math jock would prob­a­bly find this bor­ing. Here’s the code to make the icosa­he­dron. We can grab a tri­an­gle and split each edge cre­at­ing three tri­an­gles in its place. Basi­cal­ly turn­ing tri­an­gles into lit­tle tri­forces. Note that when I say split I’m not talk­ing about actu­al­ly run­ning an oper­a­tor and cut­ting the edge, but rather plac­ing a new ver­tex in the mid­dle of the oth­er orig­i­nal two and mak­ing three new faces. How­ev­er if we went around split­ting all edges we would quick­ly run into the same edges we have already split. This would result in a lot of dupli­cat­ed verts and a headache when try­ing to build the faces. To pre­vent that, let’s keep a list of the edges we have already split (a cache), and check it before split­ting. This cache will be a dic­tio­nary. The keys will be the index of the ver­tices, ordered from small­er to greater. That way the key will remain the same, no mat­ter how we pass the edge’s ver­tices. The mid­dle ver­tex is cal­cu­lat­ed by adding the coor­di­nates from both ver­tices and divid­ing them by 2. Final­ly we add it to the cache and return the index to make the faces list. With the middle_point() func­tion done we can move over to loop­ing and mak­ing the sub­di­vi­sions. At each sub­di­vi­sions lev­el we cre­ate a new emp­ty list of faces, and at the end we replace the orig­i­nal faces list with the new one. Then we go through each face, find­ing the mid­dle point for it’s three edges, stor­ing the indices and cre­at­ing 4 new faces from them (remem­ber the dia­gram above). We now have a mesh that approx­i­mates a sphere quite well, but still looks faceted. Time to smooth it out. This will work just fine for this script because the con­text is right for the oper­a­tor. In oth­er cas­es, you might find the oper­a­tor refus­es to run due to an “incor­rect con­text”. context in Blender is a sort of god-vari­able that con­tains infor­ma­tion about the cur­rent state of the appli­ca­tion. This includes things like mouse cur­sor posi­tion, the active area and more. You can over­ride the con­text when call­ing an oper­a­tor but cur­rent­ly there’s no easy way of know­ing what each oper­a­tor wants to see in the con­text. Luck­i­ly there’s anoth­er way to do this the “low-lev­el” way by set­ting each face in a loop. In the world of Blender script­ing “Low Lev­el” refers to skip­ping oper­a­tors and going straight to the meth­ods and attrib­ut­es of objects. from_pydata() is anoth­er exam­ple of low-lev­el work. The ben­e­fits of low-lev­el is that it doesn’t depend on con­text, it’s often more flex­i­ble and saves you the over­head of going through the oper­a­tors sys­tem. In this case you could also decide to apply smooth only on some faces. That com­pletes the third part of this series. If you are inter­est­ed in mak­ing spheres or apply points/objects in a spher­i­cal way con­sid­er read­ing more about the unit sphere and how to apply it along nor­mals. Next time we’ll go back to cubes and learn how to make a round cube, apply mod­i­fiers and more. Do you have any ques­tions, or sug­ges­tions for the next tuto­ri­als? Leave a com­ment below!